(TibetanReview.net, Dec20, 2015) – Only days after its embassy in Beijing praised China for its efforts to improve the political and civil rights of its people on the world Human Rights Day, Great Britain has rebuked Beijing, albeit belatedly, slamming its “completely unacceptable” treatment of foreign journalists and diplomats who were manhandled by police and undercover agents outside a free speech trial in the capital, reported theguardian.com Dec 17. 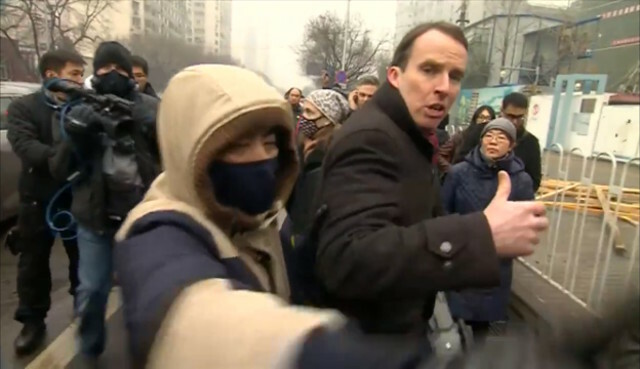 Britain was referring to the fact that on Dec 14, Chinese security forces – including many wearing facemasks, apparently to conceal their identities – physically drove reporters, diplomats and protesters from outside a courthouse in Beijing where civil rights lawyer Pu Zhiqiang was being tried for his online postings. The report noted that during the crackdown, one correspondent was thrown to the ground while others were shoved, pushed and punched by the agents. Female journalists reported suffering vicious verbal abuse from the agents. A senior US diplomat was also bundled over by police as he tried to read a statement. The report said the issue was raised by Hugo Swire, the Foreign Office minister, during a meeting in London on Dec 16 with Chen Fengxiang, a senior Chinese official. Swire reportedly told Chen such behaviour was “not acceptable”. “We are extremely concerned by events surrounding the trial of Pu Zhiqiang on Monday (Dec 14). The physical mistreatment of British diplomats and journalists at the hands of Chinese security services was completely unacceptable,” the Foreign and Commonwealth Office (FCO) was quoted as saying after that meeting. The FCO has also condemned Chinese authorities for having refused to allow diplomats and reporters entry to the supposedly “open trial” of Pu, who faced eight years in prison for posting seven sarcastic tweets. “The fact that they were refused access [to the trial] raises serious questions about due process and judicial transparency,” the statement said. An FCO spokesperson was cited as saying he incident was also being raised “at all levels” by British diplomats in China. Referring to the British statement, Chinese Foreign Ministry spokesman Hong Lei has said foreign governments had no right to “interfere with China’s judicial sovereignty”. He was further quoted as having told a daily news briefing, “The relevant personnel outside the courthouse should have obeyed the relevant requirements of China’s public security organs.” He has not explained what those requirements were.